Prior to the accession of James VI of Scotland to the throne of England upon the death of Elizabeth I, Scotland’s trade, and cultural influence had come primarily from the continent; France and the Lowlands in particular, epitomised by the confident baronial mansions which sprang up, the origins of what became known in the 19th Century as Scottish Baronial architecture. Fashions in Scottish garden design of this period had their origins therefore in the Florentine Renaissance, which encapsulated a new perception of art, philosophy, writing, aesthetics and of the natural world. Far more directly than the English gardens of the period, which have become known as Tudor knot gardens, and generally lack the exuberance and relish of order in the use of large spaces in their continental counterparts. As with gardens of the preceding medieval period, many of these gardens have been swept away as fashion in garden design and architecture changed. 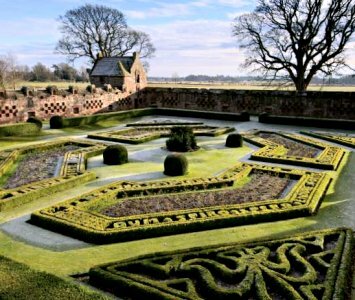 However, there are still remnants to be found, of particular note being the garden of Edzell Castle in Angus. Sir David Lindsay, a Templar, scholar and contemporary of James VI, travelled widely, and returned to his native land fired with the order and symbolist ideas he had observed abroad. He laid out the current garden around 1604. Sadly, he died in 1610, not living to see its completion, but the design is still close to the original today, with a series of ornate walled ‘rooms’, embellished with planetary and armorial symbols, and laid with stunning geometric designs in box and yew, some finely clipped to spell out family mottoes.